12-Aug-2012 -- We made a nice family trip from NYC to Toronto. We took this opportunity to introduce confluence hunting to our daughters and one of their friend who went with us on that trip. Although there was a great choice of CP along our route, we choose two points that looked really easy to reach : we visited N44 W78 on Sunday august 12 and N43 W78 on Monday august 13. This first point has been visited a year ago and is located less than 300 m off a paved road. Previous visitors asked the landowner permission to reach the point in the woods behind their house but we were reluctant to ask permission because we didn’t want to bother these people on a Sunday morning. We were about to give up our try when Nicolas spotted a gravel road with a sign indicating that a piece of land was on sale somewhere uphill. We followed that track and could park our car after 150 m. From there a small forest path was going in the direction of the CP and it led us until 40 m west of our target. We then followed our GPS receiver and zeroed the point in the undergrowth. 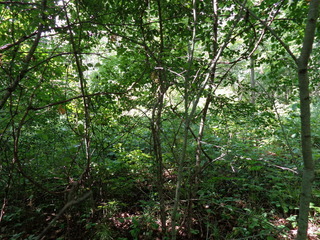 The CP is no longer located in a clearing as described by Markus Wandel back in 2001 and the vegetation is dense in every direction. After shooting the usual pictures we made a short stop in the small village of Grafton. From the low hill on wich the church is built, you can see the shinny surface of lake Ontario at about 3 km in the south.